The advancement of non-humans in the ranks of the Sith Empire's military has been slow but steady since the reforms first put forth by Darth Malgus and continued by Darth Marr. It is now estimated that up to eight percent of the Imperial military is staffed by non-humans; among the highest-ranking of these is the Twi'lek ex-slave Anri, who serves as a major in command of a prestigious Special Forces uni: Raven Squad. Anri views her advancement in the meritocratic terms of the Sith Empire at large; one's power and standing rises as they prove their superiority by overcoming the threats and impediments facing them. Her skillful leadership and gallows humor have made her popular with her fellow troops, and while her outspokenness has led some officers and Sith to question her dedication, her troops know firsthand that her determination to see the Sith Empire triumph over all foes is absolute. Having returned to the galactic stage as part of the Empire's assault on the Jedi colony of Ossus, Darth Malgus has become a topic of widespread debate and investigation once more--particularly his improbable survival after his attempted coup during the battle of Ilum. The most popular theory holds that agents of Darth Acina, then a high-ranking member of the Sphere of Technology, retrieved Malgus and resuscitated him, transforming the cyborg Sith into her own secret enforcer. That she gained control of an agent as deadly as Malgus would explain much about her subsequent rise to the Imperial throne. Some now theorize that Acina may even have used Malgus to eliminate her rivals on the Dark Council during the confusion of the war against Zakuul, though this remains only conjecture. A seasoned Jedi, Tau Idair spent years engaged in front-line combat against both the Sith Empire and Zakuul. She has a natural aptitude for lightsaber fighting techniques, as well as the mechanics of the weapon itself; her personal lightsaber has seen enough tinkering and modification to rival any hot-rodded swoop or smuggler's freighter. Tau was recruited to join the Jedi colony on Ossus by Master Gnost-Dural himself; the two of them were among the only survivors of a lengthy campaign fought in the rugged swamps of the planet Mimban. 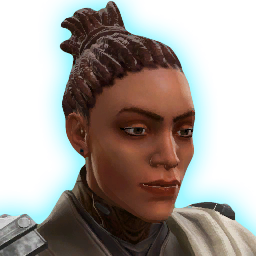 Although he was not her original master, Gnost-Dural has become a close friend and mentor to Tau, and the two of them make a formidable team in even the most dire circumstances.